How would a landowner like to see his or her river in 20 years’ time? For Rudolph Röscher of the Western Cape Department of Agriculture’s LandCare, in the light of the Western Cape drought, there has seldom been a better time to ask this. In the Cape Winelands, the question is particularly relevant. Landowners living along the banks of the Breede River and its tributaries are heavily dependent on rivers. Most are wine and fruit farmers. They irrigate their crops from the rivers. So their livelihoods depend on a healthy river system. 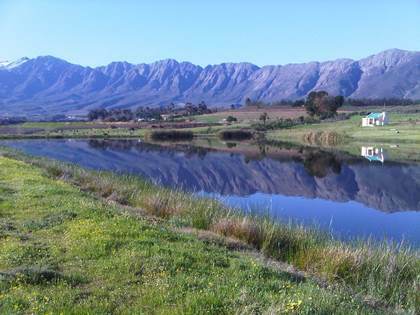 Farmers in the Cape Winelands have a clear advantage when protecting the stretch of river that crosses their land. Many are signatories to River Maintenance Management Plans (RMMPs). These plans offer a proactive approach to farmers. They help solve challenges farmers face when managing floods and droughts. As a result of LandCare’s drive, RMMPs have now been written up for more than 450 km of riparian zone in the Cape Winelands, involving some 2 000 farmers. A further 215 km are in the process of being formalised. ‘RMMPs give farmers a way to restore the river, and they create awareness of how the river works, the hydrology and service rivers deliver,’ Röscher said. Landowners who sign RMMPs adhere to a set of rules that protect the integrity of the river. They sign voluntarily, agreeing that any work in the river takes place as per the guiding principles of the RMMP. Maintenance activities cannot change the size of structures and must include invasive alien clearing. Secondary channels must be reopened, and disturbed areas must be rehabilitated. Ironically, the use of RMMPs in the Cape Winelands came about not as a result of drought but rather due to floods. The first such plan in the district was signed along the Central Breede River in 2013. Louis Bruwer, CEO of the Central Breede River Water Users Association, says small streams below the Brandvlei Dam were infested with invasive aliens and some streams had become blocked. Something needed to be done to help the river flow naturally. ‘We realised that RMMPs were a good way to tackle this problem. And we had great success ultimately,’ said Bruwer. Partnering with LandCare, they started to investigate RMMPs. Two years and R250 000 later, an RMMP had been written up for a 75 km stretch of the Breede River, starting below Papenkuils Wetland. Röscher said LandCare has steered the development of RMMPs with landowners because they are so easy to use. They reduce long waiting periods that landowners traditionally experienced when applying for river maintenance. In the past, it could take two years to complete an environmental impact assessment. And the RMMPs have reduced application costs. In the Central Breede River, the RMMP process is ‘simple’, says Bruwer. Landowners fill in a two-page document, stipulating why river maintenance work is needed. A committee evaluates the proposal, undertakes a terrain visit, and then monitors the work once it has been completed. ‘If farmers are worried, they now ask us for advice. I think farmers are working even better together with LandCare, the Breede-Gouritz Catchment Management Agency (BGCMA), and with CapeNature because of this,’ said Bruwer. For farmer Pieter Brink, a member of the Upper Breede Water Users Association, RMMPs have helped him work within the scope of the law. He now has direct access to help in LandCare and can ask for advice with regards to river health and managing his river. In fact, RMMPs have proven so successful along the banks of the Breede River and its tributaries that farmers along the Berg River are now also investing in RMMPs.